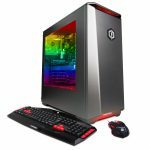 iBUYPOWER Slate 9210 Gaming PC Review, Does The Price Make Sense? Let’s review the iBUYPOWER Slate 9210 gaming PC since it’s a big seller right now when it comes to ultra pre-built performance on Amazon. Is it worth the price? That’s the big question. When you need to know whether or not a PC like this is worth the asking price you need to take a look inside and see what is actually being offered for performance and that’s exactly what we’re going to be looking at with this post. It’s time to review the Skytech Archangel II gaming PC. It has newer hardware compared to the older iteration, but does the power per dollar make sense? Is it worth getting over the other desktops on the market? Let’s find out! I did a review of the original Skytech Archangel desktop a long while ago. This new version has been increasing in popularity just recently which boasts having newer hardware, but it’s also higher priced. As always, I’ll be going over all of the hardware included with the Skytech Archangel II and share whether or not it’d be recommended for the price. CyberPowerPC Gamer Panzer PVR1050 Review, Should You Build Your Own Instead? It’s time to review the CyberPowerPC Gamer Panzer PVR1050 gaming computer because it’s becoming a hot seller and someone needs to explain what it’s capable of! 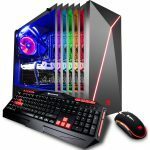 CyberPowerPC has been around for a long time now and recently they’ve been coming out with new pre-built desktops that include the new hardware. That’s great but it’s also great to understand whether or not it’s worth it when looking at power per dollar spent. With that, let’s get to the review! 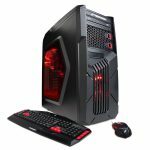 CyberPowerPC Gamer Xtreme GXiVR8020A2 Desktop Review, A VR Ready Computer? 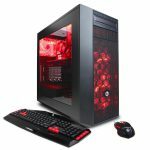 Today I’d like to review one of Amazon’s top selling computers which is the CyberPowerPC Gamer Xtreme GXiVR8020A2 desktop. It is promoted as VR ready, but is it actually ready? VR today takes quite a bit of power and the future of it will inevitably take more so any gaming PC that is advertised as being “ready” for it had better have the future in mind as well. CyberpowerPC Gamer Ultra GUA3400A Gaming Desktop Review, Where Does It Lack? The CyberpowerPC Gamer Ultra GUA3400A gaming desktop is one of the top sellers on Amazon right now so I figured it was time to write up a review of it. As always, it’s a better idea to build your own computer since you get the most bang for your buck – meaning that you actually get the right amount of power behind each dollar that you invest in it. I get it, some people think that they wouldn’t be able to put a build of their own together and I’m not saying that’s a totally bad thing, some people just want to upgrade the graphics card as well as not having to worry about actually putting it together. 9/10 times pre-built PCs aren’t a good idea and that’s exactly why I always preach for people to build their own. You save so much more money for what you get out of building your own.